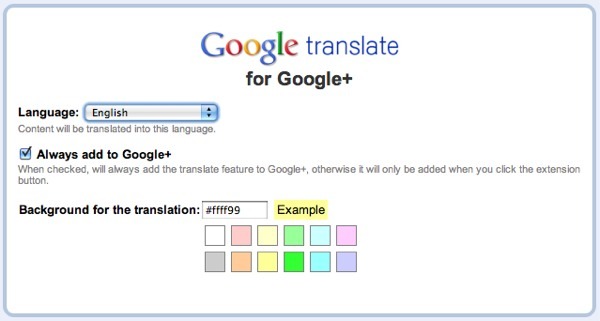 A Google Chrome extension for Google+ lets users translate posts and comments into more than 50 languages. "We've heard from a lot of Google+ users wanting an easier way to understand posts written in other languages," explains Google+ engineer Josh Estelle, who notes that the feature is still in its experimental phase. The free extension uses -- what else -- Google Translate. To install it, download it from the Chrome web store and refresh your Google+ page. There are a couple of ways to use the feature. Below each post, click the "Translate" link to convert the post into your default language [ change the default in the extension settings, located in the toolbar ]. 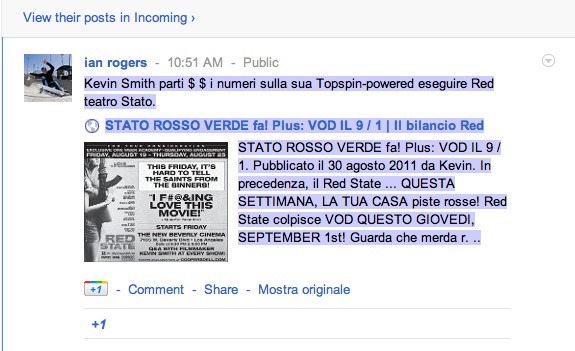 You can also translate individual comments on a post. In the extension settings, you can toggle the always on/always off option for the "Translate" box and change the background color of the translated text. One flaw a user pointed out: the extension can't handle posts in multiple languages. "In these instances, it might be useful to highlight a segment that is in another language to be translated, if the user selects that segment and gives a command via the right mouse click," Aswath Rao writes. That's something Josh appears willing to take on. "When the extension translates it guesses the language of the whole post and translates based on that one language," writes Josh. "So you're right that it will have trouble if there are multiple languages. We'll look into whether there's a reasonable way we can fix that."